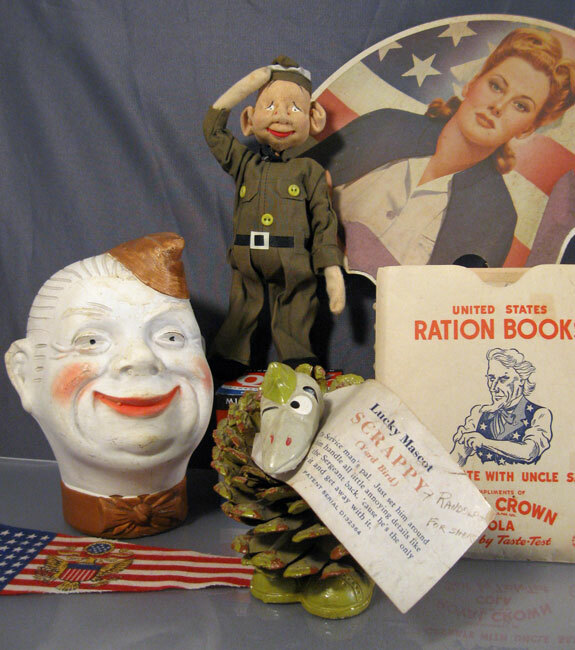 World War II home front collectibles have become a growing interest for Jim and me, so we were very happy to add a few new items to our collection during the course of our road trip. Pictured is a grouping of some of the items we found. Among our better finds was the “Hi Buddy” ceramic soldier head. He turns up with some frequency on the antique circuit, but this example has nice, bright paint and only a few minor condition issues. He is marked “Hi Buddy” on the back of his shirt collar and is an early type of “Chia Pet.” The striations on his head are meant to grow a grassy form of hair! He was made by the Morton Pottery Company in Morton, Illinois. We were immediately drawn to the cloth saluting soldier doll with a paper Shackman label on his back. He is eight inches tall and in excellent condition. He has wire arms and legs which make him very posable. He also has a Christmas tree hook through his cap, so he could be hung up. While he looks like a WWII G.I., he couldn’t possibly have been made during the war because the label says that he was made in Japan. This doll either predates the war by a few years or was made in the 1950’s after occupation ended. The Shackman Company started its toy and novelty business in 1898 and continues to this day so either date works. I’d like to think that this little guy was available for young wives and little sisters of soldiers to buy at the local Woolworth’s in 1942, but I don’t know for sure. 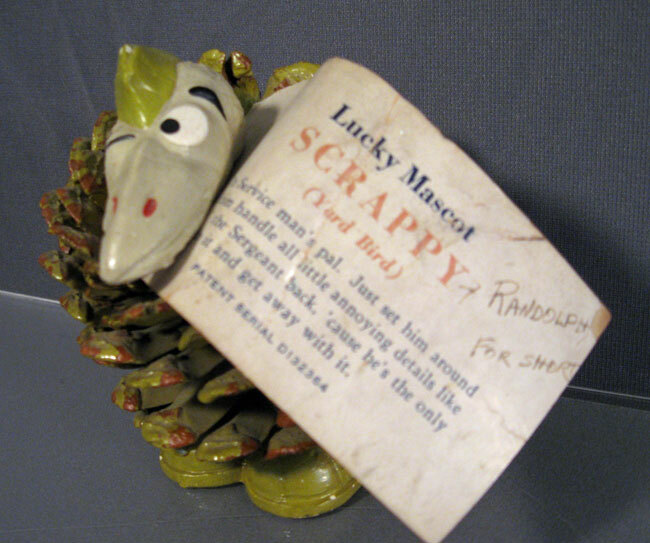 Last, but certainly not least, in our WWII acquisitions is Scrappy (Yard Bird), the Lucky Mascot. Thankfully, he has his original tag explaining that he was a “Service man’s pal” who could handle the annoying details like sassing the sergeant back. 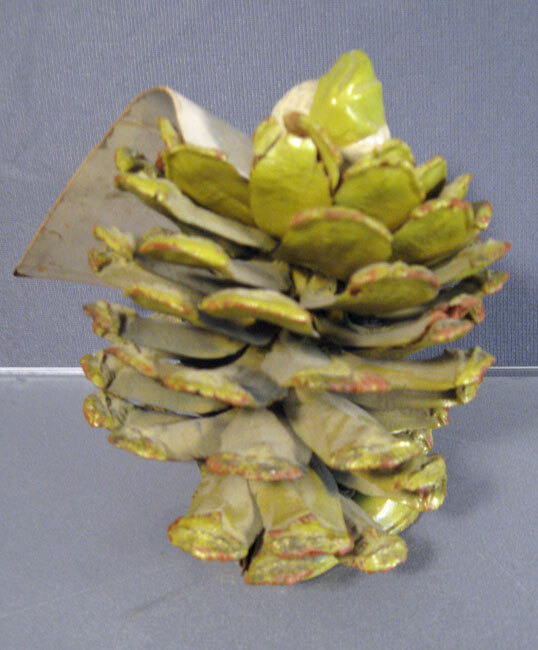 Without his tag, one would be left pondering the meaning of this painted pinecone with a weird attached head and boots! There is a patent serial number on the tag, but no company name, so who made Scrappy is a mystery. It was likely a very small company with a handful of employees or even a cottage industry that produced him. In the South, a yardbird is a chicken, and Scrappy could be a chicken. During WWII, “yardbird” was a slang term for a basic trainee because much of his time was spent out in the yards. My guess is that some creative entrepreneur who lived near an army post filled with new recruits came up with the idea of Scrappy. Whatever his origins are, I doubt too many Scrappys still exist. We’ve never seen one before, and that’s why he left his temporary home in a case in an antique mall in Missouri and came back with us. This entry was posted in 1940's, Americana, Carol, Comic Characters, Historical, Humor, Road Trip, Weird, WWII. Bookmark the permalink.